Hello and welcome to JudyGarlandsRubySlippers.com! We create hand-sewn ruby slippers, near identical to those worn by 16-year-old Judy Garland when she played Dorothy in The Wizard of Oz, a musical film released in 1939. 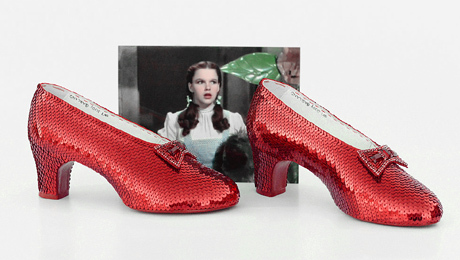 The shape and size of our ruby slippers matches the "Witch's Shoes" or the "beauty pair" as they are sometimes called because they were used in close-up shots including the scene when Dorothy clicks her heels to return home to Kansas. Thank you so much for stopping by our website. Please feel free to browse around for the information you need, and also have a look at some of our past and recent creations. 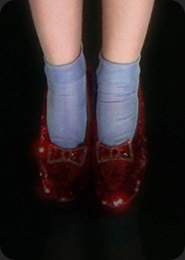 Exquisite pair of wearable hand-sewn ruby slippers in Judy Garland's size 5B that we crafted for a big fan. 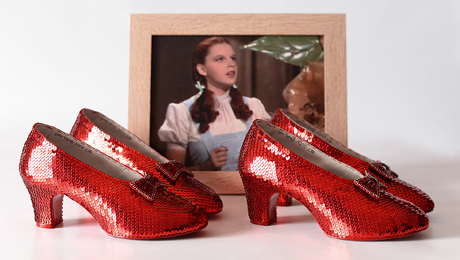 The base shoes on these ruby slippers are made from scratch, and pair of wooden heels are hand cut from scratch. This pair of ruby slippers contains an authentic Innes Shoe Company golden embossed label stamped inside the right shoe. If you wish to place an order for a pair of hand-sewn ruby slippers like these from us, please contact us to discuss your needs. 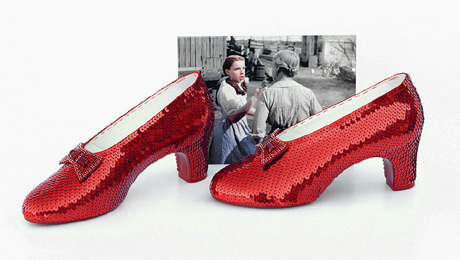 Judy Garland's ruby slippers were created in a special way like no other shoes in the world! 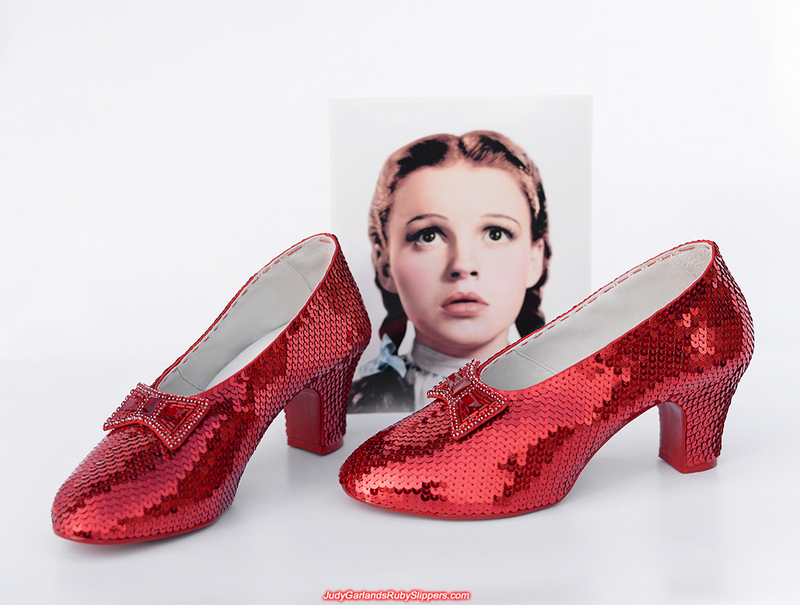 In a nutshell, the original ruby slippers were covered with around 4,600 metallic sequins (2,300 sequins on each shoe) and they were all hand-sewn directly onto the shoes with built-in fabric. 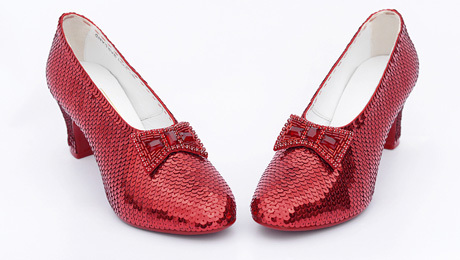 Different ruby slippers come in different shades of ruby red, from bright to dark burgundy. 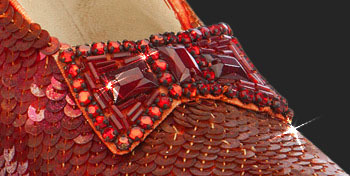 The bow on each shoe were cut out of strap leather and dyed red, then decorated with 46 red glass rhinestones with rounded antique style claw settings, 3 large high quality glass rectangular stones and red bugle beads filled the bow to give the extra shine. The actual shoes underneath all these beautiful decorations were made of 1930's white leather pumps from Innes Shoe Company Ltd in Los Angeles and then dyed red before covering with red fabric by Metro-Goldwyn-Mayer Studios (MGM). 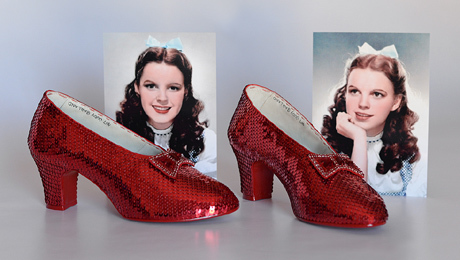 Some of the original ruby slippers had a gold or silver embossed stamp on the right shoe, while others had cloth sewn on each right shoe with the company's logo. 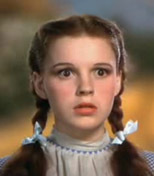 Also hand written on both shoe is Judy Garland's name which is still visible today. "I loved the music and I loved the director, and of course I loved the story." One of our loyal customers posted a short YouTube video of a beautiful pair of size 5B ruby slippers that we recently crafted. Exact replica of the ruby slippers worn by Hollywood teen sensation Judy Garland as Dorothy in 1939's classic film, The Wizard of Oz. Some of the best hand-sewn ruby slippers in size 5B made by JudyGarlandsRubySlippers.com, and have been sold. View first pair | View second pair | View third pair. We are very experienced and talented in making beautiful hand-sewn ruby slipper bows, check out some of our bows. Which method is the same technique used by MGM Studios to make the original ruby slippers? We"ll give you the answer. 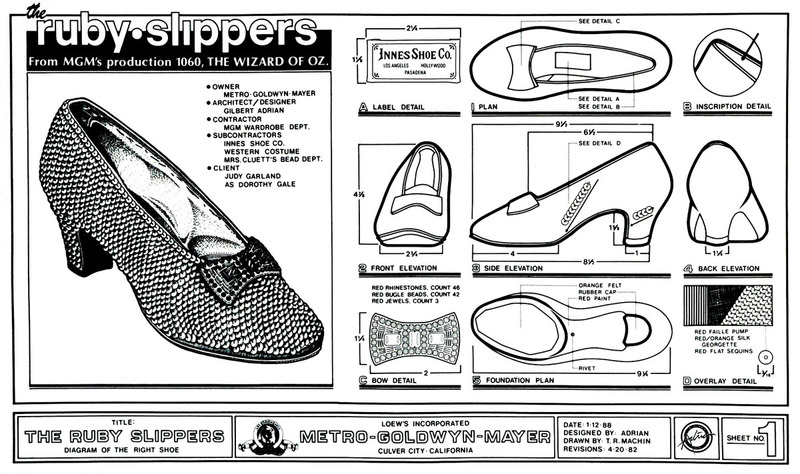 Provided by Mr. Rhys Thomas, the author of The Ruby Slippers of Oz, this is the diagram on the construction of the ruby slippers for Judy Garland as Dorothy to wear in The Wizard of Oz. A rare letter about the ruby slippers by Kent Warner, the costume designer who found Judy Garland's ruby slippers on the MGM back lot in 1970.